Love it or hate it, your job is a big part of your life. But you probably don’t go to LinkedIn everyday. Maybe you only visit a few times a year. 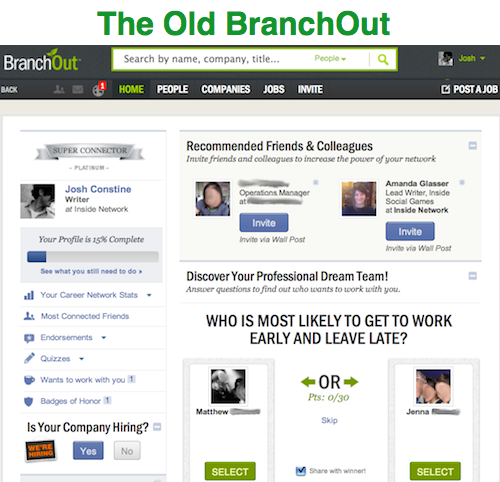 BranchOut thinks your professional network should be more like a home than a tool. So five months ago it stopped updating its app in preparation for today. What’s emerged is a more vivid way to tell the story of how you bring home the bacon. The original BranchOut was designed for growth. Viral hooks littered the home page, asking you to invite colleagues or answer silly quiz questions about friends. They worked…at least in the sense that they got people signed up. With the help of a dedicated growth team and mobile app, BranchOut swelled to 30 million registered users. Mo traffic, mo problems, though. Product development halted because “it was a huge drain on our resources. All the engineers were focused on keeping the site up. We were spending a lot of money on bandwidth,” says BranchOut founder and CEO Rick Marini. And despite lots of registrations, users weren’t spending much time on the app. BranchOut’s monthly active user count fell from 13.5 million in April at the height of its growth spurt to just 3 million this month, according to AppData. Marini confesses, “we built a utility used episodically” when people changed jobs, but otherwise rarely visited. BranchOut needed engagement. Five months of heads-down development later, the new BranchOut took flight today. It’s cleaner looking, ditching black for a palette of whites and light grays. Your home page will seem familiar. 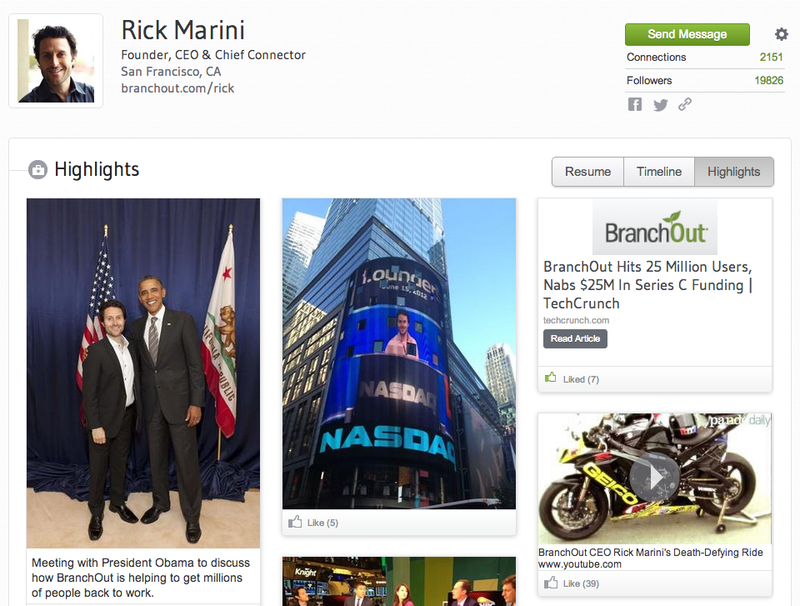 BranchOut has adapted two of Facebook’s most powerful features: the news feed and the Timeline. You’ll begin by a prompt to post “What’s happening at work?” which is shared publicly by default or can be locked down to just your Facebook friends and BranchOut connections. All your posts are aggregated into a Timeline on your profile that hopes to tell much more than the resume it also hosts. A Highlights tab lets you feature your brightest moments, like closing a bid deal, a photo from your visit to a famous company’s office, the launch of a new product, or your startup getting written up in TechCrunch (not a humblebrag, Marini gave that example). If you’re “Looking for inspiration,” the Discover tab displays a Pinterest-style grid of updates from thought leaders chosen by the BranchOut editorial team. For now everyone sees the same set, but BranchOut hopes to personalize the Discover content and offer browsing by industry for a more relevant experience. The Connections and Jobs sections are mostly the same as before but with a facelift. They help you determine which friends have worked at a company and browse open positions being advertised by employers. Meanwhile, BranchOut’s powerful search feature lets you look up a company you might be interested in working at or partnering with. BranchOut will show you first-degree connections who’ve worked there, and second-degree connections you could ask mutual friends for an introduction to. Unfortunately, BranchOut doesn’t show mutual connections of profiles so it’s hard to tell who to ask for an intro. Marini tells me the goal is to make BranchOut “something you can come back to every day” or at least every week. BranchOut is also trying to differentiate itself in both how it feels and why it’s useful. “LinkedIn is a group of people I met at a conference — very loose relationships,” says Marini. You don’t know these people well enough to ask them for a recommendation, referral, or introduction. Since BranchOut is built off of your Facebook social graph and it isn’t normal to send connection requests to people you only met once, your BranchOut ties are stronger, and they could actually help you get hired or find clients. Say a company wants a Ruby On Rails guru. Not just someone proficient, but a rockstar. Their recruiters could see on BranchOut that you attend Ruby conferences and share updates about major code pushes or bugs you’ve squashed. The color shown on BranchOut could make you stand out. But do people really want to maintain another social profile? And are our work lives interesting enough to share? Marini’s betting BranchOut on the answers being “yes.” He tells me his users were clamoring for a place to discuss their jobs with others in their industry, because they didn’t want to annoy friends. He also imagines it helping small businesses and entrepreneurs to grow their networks by deepening relationships with existing contacts and forging new ones by getting featured in Discover. I’m honestly skeptical. Highlights is a great idea, and I might share something to BranchOut once a month, but every day is a stretch. It may need the ability to import posts from Twitter and Facebook if it wants enough content to keep the news feed vibrant. Also, the BranchOut publish is too minimal. If I’m sharing something that’s ostensibly going to be part of my resume, I want to add more details and craft a high-quality story rather than a quick post. In the end, BranchOut is making a play for more data, and that’s typically a smart move. With big data solutions improving, it could lure recruiters by having the most fleshed-out profiles. And considering how much money companies spend finding talent, a subscription to BranchOut could be a cheap way for teams to grow in the right direction.